Parents have said it countless times, no doubt invoking the electric bill when telling children to turn off bedroom lights before heading to another room in the house. But let's be honest: an occasional light left on is hardly your biggest enemy when it comes time to tame your energy costs. Maybe people should yell, "Turn up that AC!" in summer, while switching to ":Turn down that heater!" in winter. Why? 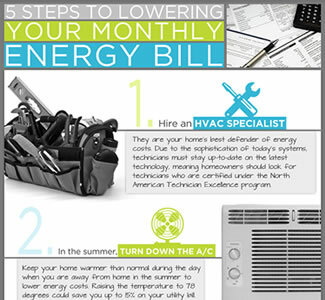 According to the Department of Energy, more than 50 percent of a home's energy cost come from heating and cooling. Thankfully, there are solutions to this problem which can help you reduce your overall energy usage and potentially shrink the size of your energy bill. Something as simple as a programmable thermostat can take charge of your heating and cooling costs. In summer, just program it to keep your home warmer than normal during the day in the summer, and then program to cool your house to a reasonable temperature when everyone gets home in the afternoon and evening — in this case, 78 degrees F.
The same practice can be used during the winter. If you set the thermostat to 68 degrees F while you are home, and lower the temperature when you are away or asleep, the savings can add up, possibly as much as 1 percent for each degree. Of course, any savings from that thermostat would be minimized if your system doesn't run properly, which is why it's important to use a licensed and insured HVAC specialist to inspect and adjust your heating and cooling systems. Due to the sophistication of today's systems, technicians must stay up-to-date on the latest technology, meaning homeowners should look for technicians who are certified under the North American Technician Excellence program. It's also important to find the right technician to install or service your system, so start by asking your friends and neighbors for recommendations. You need to do your homework to separate the qualified from the not-so-qualified. Find a person you're comfortable with, someone who will take the time to find out what's best for you and your home. Don't hesitate to ask for referrals and copies of license and insurance - good contractors want to show them off these qualifications. Don't take the infrastructure of your home for granted. Your ductwork plays a huge role in your heating and cooling needs and costs. Ductwork is a key problem for loss of energy in homes today. Putting in a new air conditioning unit without addressing the ductwork is like installing a new engine in your car and reusing the old oil. According to the U.S. Department of Energy, air leakage from faulty ductwork in attics or crawl spaces can lose up to 40 percent of the heated or cooled air that passes through en route to the vents in your home. Homeowners can play a part in efficient heating and cooling as well, and this starts with proper insulation. Also, check the weatherstripping and caulking on your windows and doors to plug the air leaks throughout your home. This will prevent hot air from entering your home, meaning your air-conditioning system has to work less hard to keep your house cool. By paying attention to the status of your air conditioning and heating system, you can ignore the occasional light your kids leave on, saving your time and energy for the other parenting staple: "Clean up your room!" For more information on home maintenance, call Direct Energy Protection Plans at 1-888-733-1683 or view our available protection plans online.